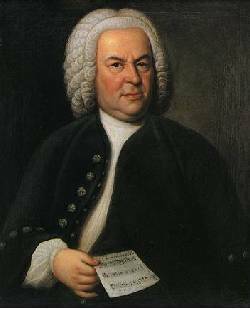 Johann Sebastian Bach was born in Eisenach, Germany, on 21st March 1685, the youngest son of Johann Ambrosius Bach, a court and town musician. Johann Sebastian was orphaned before he was 10 years old, and was taken into the family of his older brother Johann Christoph, an organist and pupil of Pachelbel. For the Bachs music was very much a family business, and not surprisingly the young Johann Sebastian received an extensive musical education. In 1708, after a succession of positions as organist and choirmaster, he became a court composer at Weimar. Here he enjoyed a few happy years, during which he married his second cousin Maria Barbara, but he became embroiled in court politics, and in 1717 his attempts to leave his position resulted in a period of imprisonment for insubordination. Eventually he was released from Weimar and took up a new post as director of music at the court of Cothen. Bach's years at Cothen were initially happy and fruitful; his patron and friend, Prince Leopold, was truly musical and seems to have appreciated Bach's genius. In 1720 Bach's wife died, and 18 months later he married Anna Magdalena Wilcken, herself an accomplished musician. Prince Leopold also married, but as his new wife took no interest in music Bach's role as court musician declined. In 1722 he left Prince Leopold's services to become cantor at St Thomas's church in Leipzig, an important post offering a higher salary which was becoming increasingly necessary for the support and education of his large and growing family. Bach's stay in Leipzig was not particularly happy for him, being marred by constant conflict with the authorities. His attempts to obtain a new position failed, and in 1750 he died of a stroke following a disastrous operation intended to improve his failing eyesight. The popular modern conception of Bach as a dull, "ivory-tower" academic could hardly be further from the truth. His life story is littered with evidence of his spirited character, fiery temper, and strong dislike of unreasoning authority. Records of his time as a young man at Arnstadt include many reprimands for unauthorised leave, for "making many curious variations in the chorale, and mingling many strange tones in it... that the Congregation has been confused by it" (Bach's musical inventiveness clearly left lesser mortals behind! ), for "playing the organ rather too long, but after his attention had been called to it by the superintendent, he had at once fallen into the other extreme and had made it too short", and finally, "by what right he recently caused the strange maiden [possibly Maria Barbara] to be invited into the choir loft and let her make music there"! Clearly he could be difficult and somewhat cantankerous, but to his friends and most colleagues he was good company  lively, gregarious and hospitable. According to his son C.P.E. Bach "his house was like a beehive, and just as full of life. Association with him was pleasant for everyone, and often very edifying". Unfortunately, in Bach's time the pianoforte was very much in its infancy. A very early piano, made by the famous organ-builder and clavichord-maker Gottfried Silbermann, was shown to him, and although he praised and admired its tone he complained that it was "too weak in the high register" and that it was too difficult to play (i.e. the action was too heavy). Silbermann later made changes to his instruments to take account of Bachs important criticisms. Two of Silbermanns pupils, Zumpe (in London) and Stein (n Vienna), went on to become major piano builders, Zumpe hiring the Scottish cabinet maker Broadwood who later founded the famous Broadwood piano company. Thus J.S. Bach was able to help shape the development of the piano at a crucial time in its history. Bachs son, J.C. Bach, actually gave the first ever public piano recital, in London in 1768, performing on an instrument built by Silbermanns pupil Zumpe. Prior to his approval of Silbermanns pianos Bach seniors own favoured keyboard instrument was the clavichord, which he felt was most suited to the expression of his most refined thoughts because of the subtle gradation in tone that could drawn from the instrument from the touch alone. According to his earliest biographer Forkel, Bach enjoyed the harpsichord much less because it had not soul enough for him. There can be little doubt that Bach would have loved the modern piano, which uniquely combines the brilliance of the harpsichord, the sensitivity of the clavichord, and the power of the organ.